This is the story behind the naming of one of Battle Ground’s newest restaurants, a Greek restaurant called George’s Molon Lavé. 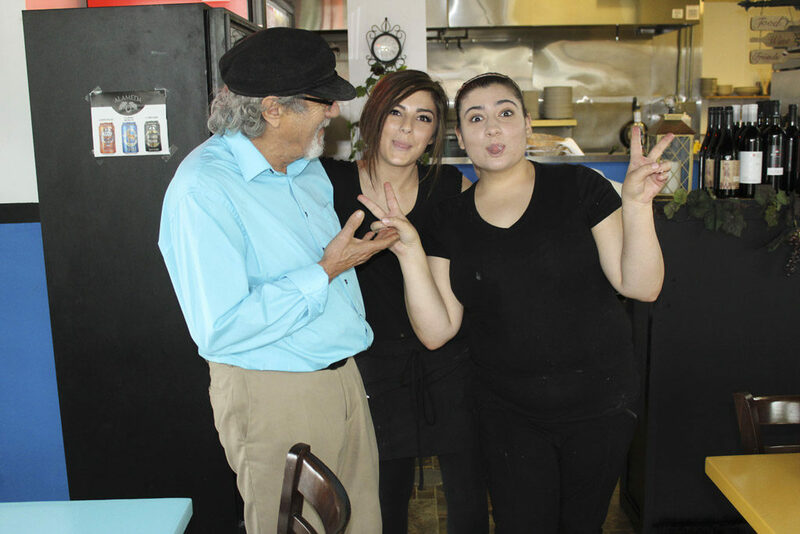 The authentic Greek restaurant was first opened by 70-year-old Vlachos on June 25. 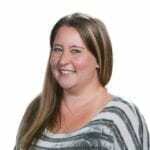 It is located at 1417 SE Rasmussen Blvd., Suite 130, in the Battle Ground Village. Vlachos’ son, 19-year-old Stefan, also acts as co-owner and head chef of the restaurant. The menu at George’s is a diverse mix of different Greek cuisine, including some items that Vlachos has kept exactly the same as his mother used to make in Greece. Some of these traditional items include Moussaka (layers of meat, baked eggplant, zucchini, herbs and potatoes, topped with a Besamela sauce); Pastitsio (a macaroni casserole covered with a light Besamela sauce); and Dolmathes (grape leaves stuffed with finely ground beef, rice and herbs, all topped with Avgolemono sauce). Everything else on the menu is authentic Greek cuisine as well and is made from recipes that Vlachos has crafted over the years. Born and raised in Greece, he became a permanent resident of the U.S. in 1972. Vlachos actually had another Greek restaurant in Vancouver for 14 years before eventually relocating to Battle Ground. Vlachos said everything at his restaurant is made from scratch, and nothing is precooked. Although gyros are of course a popular item on the menu, Vlachos and Stefan both said that people really seem to order a little bit of everything and there is really no one menu item that seems more popular than the rest. Even the burger and cheeseburger on the menu are popular, as Vlachos said they are handmade with Greek spices and herbs, Greek cheeses and Feta dressing. 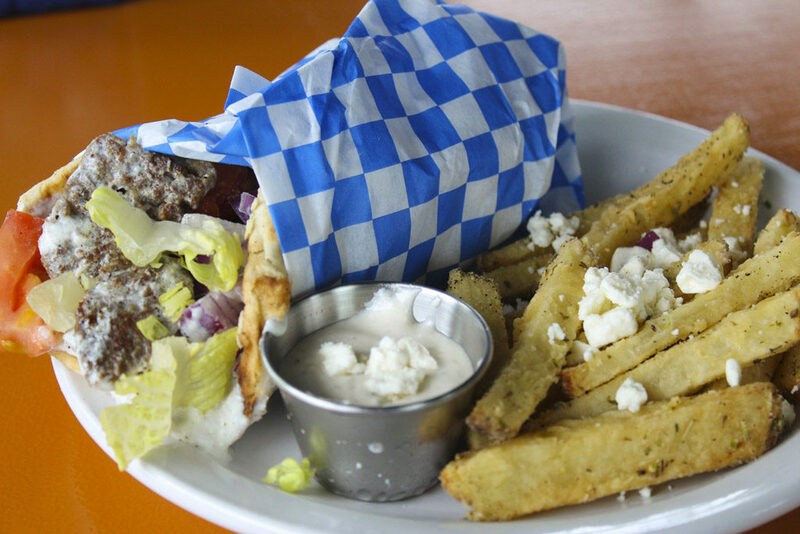 Even the fries offered as a side at George’s are given a Greek twist, seasoned with Greek herbs and spices, topped with feta cheese and served with a feta dip. Restaurant goers will find a variety of Greek appetizers, all served with warm pita bread, such as Tzatziki dip, hummus dip, feta dip, steak strips and more. 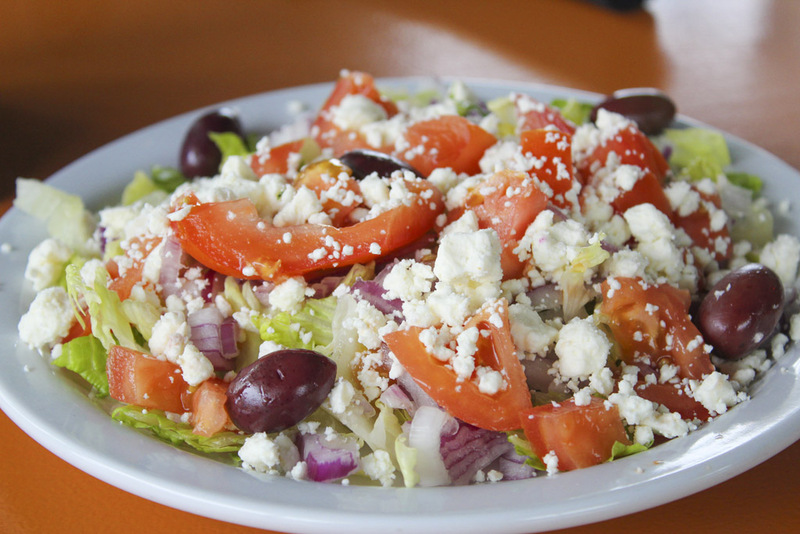 A Greek salad and Horiatika salad are both offered, complete with olives, feta cheese, cucumbers, tomatoes and onions. Seafood offered at George’s includes calamari, broiled halibut, salmon and Shrimp George, a dish with shrimp, fresh tomatoes, onions and bell peppers, all sauteed in a special wine sauce with a blend of spices, served over orzo. Other items on the menu include lamb chops, lamb kabob, chicken kabob, rack of lamb and of course a variety of gyro plates, including a lamb gyro plate, chicken gyro and a veggie gyro. Vlachos said they offer baklava for dessert, as well as Greek yogurt with different kinds of fruit. He also said if customers would like a specific kind of dessert, all they need to do is ask. A variety of domestic and Greek wines are available to go along with lunch or dinner. The food isn’t the only thing Greek at George’s, the restaurant itself is covered in Greek artwork and really gives off a feeling of Greek culture right when you walk in the door. The atmosphere becomes even more Greek on Friday nights beginning at 6:30 p.m. when patrons are able to enjoy live Greek music. In addition to Stefan, Vlachos has one other son and a daughter, as well as six grandchildren. He said his children have helped with cooking things in the kitchen since they were very young, and he began cooking at a very young age as well after watching his mom in the kitchen as a young boy. 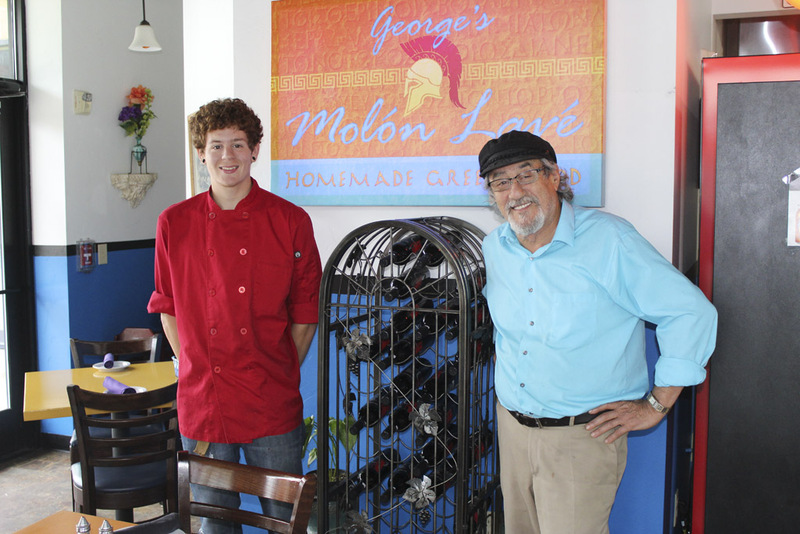 George’s Molon Lavé is currently open for lunch and dinner, Mon.-Thu., 11:30 a.m.-9 p.m. and Fri.-Sat., 11:30 a.m.-10 p.m. The restaurant is currently closed on Sundays, but Vlachos said he is thinking of possibly opening from 11 a.m.-5 p.m.
For more information on George’s Molon Lavé and to see the complete menu, visit the restaurant’s website or their Facebook page.